Spring has sprung and if you’re like me, you’re starting to get a little restless. This is the time of year when my friends wonder what I’m going to be up to next. It could be fun, it could be trouble; it’s likely a little of both! If you’re pulling off your snow boots and putting on your party shoes, then this list should get your compass pointed in the right direction. 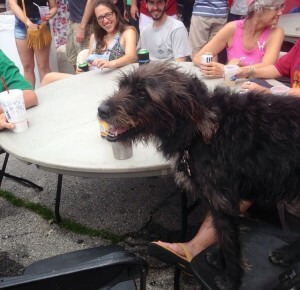 Here are three can’t miss spring festivals that welcome your best furry friend, along with a few suggestions on eats and activities in these super dog-friendly locales. Each year, the National Cherry Blossom Festival commemorates the 1912 gift of 3,000 cherry trees from Mayor Yukio Ozaki of Tokyo to the city of Washington, DC. The festival coincides with the blooming of the trees and features a variety of educational and cultural activities including the Sakura Matsuri Japanese Street Festival on April 16th. Many of these public events are free and well-behaved leashed dogs are welcome. Weekdays will be less crowded than weekends and evenings. On April 9th there is a fireworks show at 8:30 and on April 16th a parade from 10 a.m.-Noon . Dogs hate fireworks and most don’t ‘love a parade’. You should plan to visit the Tidal Basin to enjoy the blooms in various stages. 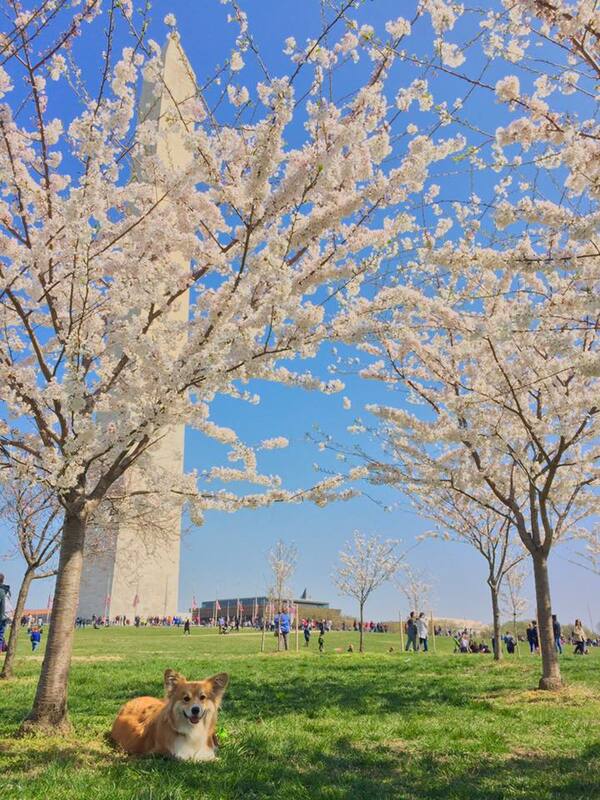 Dogs are allowed on the National Mall and Memorial Parks but you must keep your pup on a leash 100% of the time. Never is an owner allowed to let a dog run freely in any of these locations. Also, and this should go without saying, but since it’s on their website…Owners are NEVER allowed to let the dog “go to the bathroom” in the Reflecting Pool or in the pool at the World War II Memorial. The National Park Service has had and continues to have problems in this regard. Don’t be a problem. Oyster happy hour, specialized cocktail menu new every Thursday night, a pick 5 veggie plate with a heaping pile of veggies for only $20, and if you know to ask- and now you do- they’ll give you Goldfish crackers while you wait. Dogs like these. *Special thanks to our Facebook friend, Moogle the Fluffy Corgi, for letting us use his photo. Alys Beach? Never heard of it? Well, you should. Founded in 2004 and located in South Walton along Scenic Highway 30A between Destin and Panama City, it was recognized by Southern Living as the ‘Perfect Beach Town’. 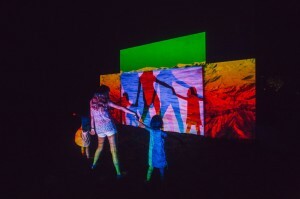 With streets that orient toward the beach to take advantage of the view and the gulf breeze, this planned community boasts iconic white washed buildings that come alive with color during the annual Digital Graffiti event. Using projectors and laptops instead of paint and canvas, in 2016 20 artists from 10 different countries will light up the Alys Beach with their technicolor visions and energetic creations. 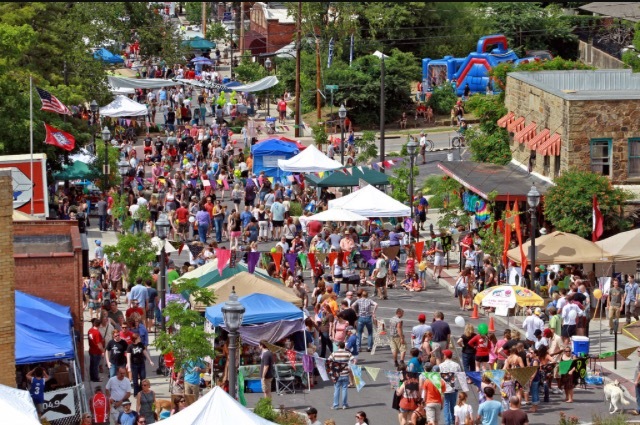 Now in it’s 9th year and growing ever more popular, you can stroll the dog-friendly pedestrian walk ways each evening of the festival, weather permitting, and enjoy the lively, often interactive, art scene. For a more relaxing activity, take your pooch for a morning stroll along the elevated wooden boardwalk through the 20-acre nature preserve. After that you can relax with a cool refreshing adult beverage on the ‘Lilly Pad’, the grassy patio area at George’s where dogs are allowed. We suggest you try something tasty off the playfully named ‘Misbehave’ side of the dining menu. Please note: South Walton does not allow dogs on any of their 16 area beaches unless you are a full-time permanent resident or property owner with a permit. Visitors cannot buy guest passes for their dogs. We think this is dumb. Right in our own backyard, Block Street Block Party is in its 6th year. Showcasing everything groovy about U.S. News and World Report’s #3 Best Place to Live, I can assure you Fayetteville knows how to party! From 12 p.m. to dark (and then some), you can roam the streets of the Block Street business district enjoying food and merchant vendors, outdoor stages and beer gardens, retail shops and bars. With six stages and 5 outdoor beer gardens, this festival gets very crowded and loud. When communicating with Henri last year, I often had to get on his level to make sure I had his attention or he heard me. Hand signals were very handy! *I do NOT judge Bo and his people, pictured left. Bo is a reading dog at the library and his parents are very good humans. They probably had a really good dog trainer when Bo was a puppy, but that’s just a guess. If you need a bit of downtime or some air conditioning (you never know about Arkansas weather), you can escape the street at Big Star Lounge on the north end or chill in the green space at St. Paul’s Episcopal Church one block over on N. East Avenue. If you’re so inclined, you can also take your dog with you to the 7:30 a.m. Sunday service that is ‘officially’ pet friendly. For a special keepsake, visit our buddy David at David Adam’s Fine Jewelry at the top of Block for a dog bone shaped pendant with your best furry friend’s name engraved on it. Did we miss your favorite spring festival? Tell us about it in the comments! You can also follow us on Facebook, Twitter and Instagram for more travel tips and to see where we go next.